Facebook dynamic ads automatically show ads for your listings to people who have expressed interest on your website. For Real Estate Agents, Dynamic Ads are a perfect because when someone views your listing it’s a great indication of interest and dynamic ads enable you to continue to target them. And the entire process is automated. No selecting targeting criteria, creating ads, stopping or starting ads. Unfortunately, dynamic ads do require some programming in order to setup and maintain. Mere mortals will have to hire a professional to setup, configure and maintain your “catalog” of products (listings) we will send Facebook daily, or more often. 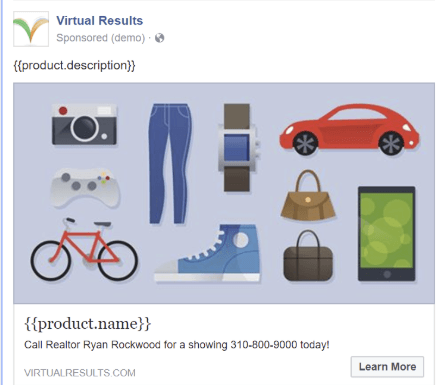 Visit Facebook’s official resource to get started and learn more about Dynamic Product Ads for Real Estate.